This book investigates how French Romanticism was shaped by and contributed to colonial discourses of race. It studies the ways in which metropolitan Romantic novels—that is, novels by French authors such as Victor Hugo, George Sand, Bernardin de Saint-Pierre, François René de Chateaubriand, Claire de Duras, and Prosper Mérimée—comprehend and construct colonized peoples, fashion French identity in the context of colonialism, and record the encounter between Europeans and non-Europeans. While the primary texts that come under investigation in the book are novels, close attention is paid to Romantic fiction’s interdependence with naturalist treatises, travel writing, abolitionist texts, and ethnographies. 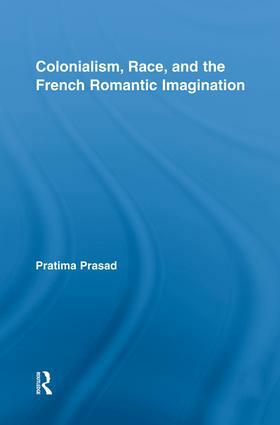 Colonialism, Race, and the French Romantic Imagination is one of the first books to carry out a sustained and comprehensive analysis of the French Romantic novel’s racial imagination that encompasses several sites of colonial contact: the Indian Ocean, North America, the Caribbean, West Africa, and France. Its archival research and interdisciplinary approach shed new light on canonical texts and expose the reader to non-canonical ones. The book will be useful to students and academics involved with Romanticism, colonial historians, students and scholars of transatlantic studies and postcolonial studies, as well as those interested in questions of race and colonialism. Ourika, or, Comment peut-on être noire?